A groin strain is an overstretch or tearing injury to the muscles of the inner thigh or front of the hip. Groin strains make walking, lifting the knee, or moving the leg away from or toward the body difficult and painful. Groin strains can occur from overuse of the muscles, or from a sudden contraction of the muscles. Grade 1: Mild or partial stretch or a tear of a few muscle fibers. The muscle is tender and painful but maintains its normal strength. Use of the leg is not impaired, and walking is normal. Grade 2: Moderate stretch, or tearing of a greater percentage of the muscle fibers. There is more tenderness and pain, noticeable loss of strength, and sometimes bruising. Use of the leg is noticeably impaired, and limping when walking is common. Grade 3: Severe tear of the muscle fibers, sometimes a complete muscle tear. A “popping” sound may be heard or felt when the injury occurs. Bruising is apparent, and sometimes a “dent” in the muscle may be seen under the skin at the site of the tear. Use of the leg is severely difficult, and putting weight on the leg is very painful. When groin muscles are strained or torn, muscle fibers and other cells are disrupted. Bleeding can occur, which causes bruising. Within a few minutes to a few hours after the injury, swelling can occur, causing the injured area to expand and feel tight and stiff. Although groin strains most often occur in athletic activities such as football, soccer, and dance, they also can occur during everyday activities such as lifting heavy items, slipping while walking, or climbing stairs or ladders. 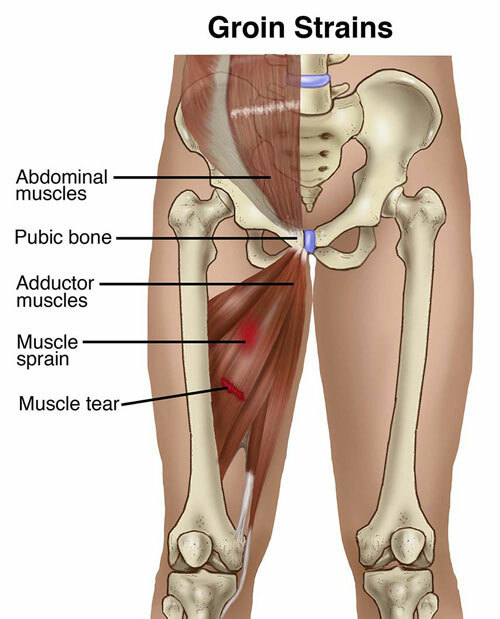 A groin strain causes sharp pain or spasms in the groin area. The pain can quickly resolve, or it can persist, developing into a throbbing pain at rest with sharp stabs of pain when you try to move your leg or walk. The muscles can feel tight or weak. Trying to lift the leg or knee, or bringing the knees together, can also cause sharp pain. These movements can feel tight or even cause the groin muscles to spasm. If the groin strain involves a Grade 3 (complete) tear, a "pop" may be felt or heard when the muscle tears at the time of injury. Your physical therapist may use additional tests to assess possible damage to other parts of your body, such as your hip or lower back. To provide a final diagnosis, your physical therapist may collaborate with an orthopedist or other health care provider. The orthopedist may order further tests—such as an X-ray or magnetic resonance imaging (MRI) —to confirm the diagnosis and to rule out other potential damage. These tests, however, are not commonly required for groin strain. Your physical therapist will design a specific treatment program to speed your recovery. This program will include exercises and treatments you can do at home to help you return to your normal lifestyle and activities. Rest the area by avoiding walking or any activity that causes pain. Crutches may be recommended to reduce further strain on the muscles when walking. Apply ice packs to the area for 15-20 minutes every 2 hours. Consult with another health care provider for further services such as medication or diagnostic tests. Your physical therapist can use different types of treatments and technologies to control and reduce your pain, including ice, heat, ultrasound, electricity, taping, exercises, and hands-on therapy such as massage. Certain exercises will benefit healing at each stage of recovery; your physical therapist will choose and teach you the appropriate exercises to steadily restore your strength and agility. These may include using cuff weights, stretchy bands, weight-lifting equipment, and cardio exercise equipment such as treadmills or stationary bicycles. Your physical therapist is trained and experienced in choosing the right treatments and exercises to help you heal, return to your normal lifestyle, and reach your goals faster than you are likely to do on your own. Your physical therapist will collaborate with you to decide on your recovery goals, including your return to work or sport, and will design your treatment program to help you reach those goals in the safest, fastest, and most effective way possible. Your physical therapist will apply hands-on therapy such as massage, teach you exercises and work re-training activities. Additionally, if you are an athlete you will be taught sport-specific techniques and drills to help you achieve your sport-specific goals. Your physical therapist can recommend a home exercise program to strengthen and stretch the muscles around your hip, upper leg, and abdomen to help prevent future reinjury of your groin. These may include strength and flexibility exercises for the leg, hip, and core muscles. Surgery is rarely necessary in the case of groin strain, but if a groin muscle fully tears and requires surgical repair, your physical therapist will help you minimize pain, restore motion and strength, and return to normal activities in the speediest manner possible after surgery. Increase the intensity of activity or sport gradually, not suddenly. Avoid pushing yourself too hard, too fast, or too soon. Follow a consistent strength and flexibility exercise program to maintain good physical conditioning, even in a sport's off-season. Wear shoes that are in good condition and fit well. Brendan walks outside his house in the wintertime when the sidewalk is icy and slippery. His foot slips out from underneath him and his right leg suddenly slides forward while his left leg remains behind him. He falls down with his right leg and left leg stretched out in opposite directions, and feels immediate pain in his right groin area. He has difficulty standing up and climbing up his front steps; he limps back inside his house. Brendan is concerned because he has to climb stairs and walk at work, and his yearly ski trip is just 3 weeks away. Brendan is able to see his physical therapist the next day. The physical therapist performs tests that reproduce Brendan’s pain to a moderate degree to assess his injury. The physical therapist determines the injury is a Grade 1 strain. She begins treatment to reduce his pain and swelling using ice and electrical stimulation. She teaches him how to compress and support the injury at home and at work using an elastic wrap, and shows him simple stretches and exercises he can start in 48 hours to help restore motion. She tells Brendan they will likely be able to start strengthening his leg in a few days, and that he may still be able to go skiing with his friends, although she can’t guarantee it. She reassures Brendan that she will reevaluate him every time he comes to the clinic, and she will adjust the treatment to help him recover as quickly as possible. Over the next 3 weeks, Brendan performs his exercises and treatments at home just as his therapist instructs him, and works with her on a steady program of strengthening and recovery. Since the initial strain was mild, and Brendan followed his therapy program correctly, he takes a minimal amount of time off from work and heals in time to go on his ski trip. A physical therapist who is experienced in treating people with groin strains. A physical therapist who focuses his/her practice in orthopedics or sports rehabilitation. A physical therapist who is a board-certified clinical specialist or who completed a residency or fellowship in sports physical therapy. This therapist has advanced knowledge, experience, and skills that may apply to your condition. When you contact a physical therapy clinic for an appointment, ask about the physical therapists' experience in helping people who have groin strains. The following articles provide some of the best scientific evidence related to physical therapy treatment of groin strain. The articles report recent research and give an overview of the standards of practice both in the United States and internationally. The article titles are linked either to a PubMed* abstract of the article or to free full text, so that you can read it or print out a copy to bring with you to your health care provider. Atkins JM, Taylor JC, Kane SF. Acute and overuse injuries of the abdomen and groin in athletes. Curr Sports Med Rep. 2010;9:115–120. Article Summary on PubMed. Holmich P, Larsen K, Krogsgaard K, Gluud C. Exercise program for prevention of groin pain in football players: a cluster-randomized trial. Scand J Med Sci Sports. 2010;20:814–821. Article Summary on PubMed. Hureibi KA, McLatchie GR. Groin pain in athletes.Scott Med J. 2010;55:8–11. Article Summary on PubMed. Engebretsen AH, Myklebust G, Holme I, et al. Prevention of injuries among male soccer players: a prospective, randomized intervention study targeting players with previous injuries or reduced function. Am J Sports Med. 2008;36:1052–1060. Article Summary on PubMed. Maffey L, Emery C. What are the risk factors for groin strain injury in sport: a systematic review of the literature. Sports Med. 2007;37:881–894. Article Summary on PubMed. Nicholas SJ, Tyler TF. Adductor muscle strains in sport. Sports Med. 2002;32:339–344. Article Summary on PubMed. Emery CA, Meeuwisse WH. Risk factors for groin injuries in hockey. Med Sci Sports Exerc. 2001;33:1423–1433. Article Summary on PubMed. Gilmore J. Groin pain in the soccer athlete: fact, fiction, and treatment. Clin Sports Med. 1998;17:787–793, vii.Article Summary on PubMed. Johnson R. Ice hockey. In: Mellion MB, Walsh WM, Shelton GL, eds. The Team Physician's Handbook. 2nd ed. Philadelphia, PA: Hanley and Belfus; 1997:851. Product description is not available.